Today in2Dredging (i2D) launches its new and unique software program Pumps ‘n Pipeline (PnP v1.1). 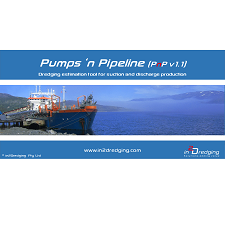 PnP is the first commercial pumps and pipeline estimating tool for the dredging and mining industry. i2D’s gap analysis identified a disconnection between project performances and production estimates. The PnP tool can optimize the use of equipment, benchmark production levels, and provide a foundation for capital investments and tenders. The last few months i2D was dedicated to the development of PnP. As ease of use and readability are primordial for fast results, an enormous amount of effort was put into an intuitive and user friendly graphical user interface. The new program makes it easy to estimate suction and discharge productions for any dredging or mining equipment that hydraulically transports soil like materials. PnP uses a unique collection of empirical relationships based on decades of field measurements. Extensive literature on hydraulic transport is available. However, all this information complicates the practical production estimate. Literature is often very specific and includes many hidden model scale effects and sub-optimisations. Therefore, PnP only applies empirical relationships which have proven themselves in the field. You can now download a free demo version from the PnP web page. The demo version allows unlimited trial use of PnP v1.1 during a trail period of 30 days. This version is fully functional except for the Pumps submenu, which is disabled. Get your free PnP demo version and find out for yourself! For further queries please contact i2D.